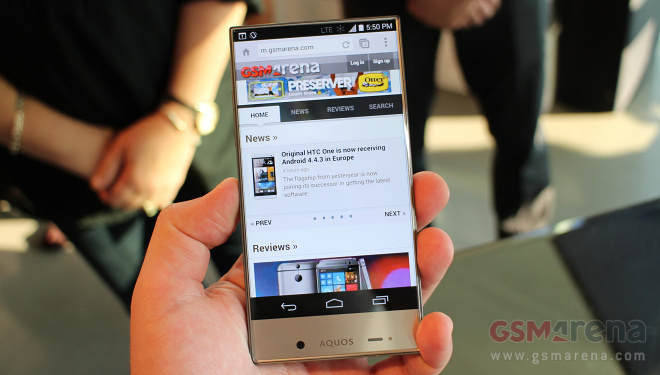 Despite its sleek looks, which suggest a high price tag, the Sharp Aquos Crystal for Sprint is quite affordable. The carrier is asking for $239.99 for a device with no contract. Its subsidiaries Boost Mobile and Virgin Mobile on the other hand, will offer the handset for $150 with no-contract plans. The Sharp Aquos Crystal looks stunning in the flesh thanks to the almost complete lack of screen bezels, as well as a dedicated earpiece. It certainly is the most memorable budget device I have ever encountered – it simply doesn’t fit the bill for one. Build quality and ergonomics are exceptional. The lack of screen bezels allow for seamless one-handed operation, while the overall fit and finish of the device, like its design, does not match its price tag. The 5” 720p display is nice and crisp if a tad lacking in pixels by today’s high-end standards. The Snapdragon 400 chipset with 1.2GHz quad-core CPU, coupled with 1.5GB of RAM, kept the almost stock Android 4.4.2 KitKat running pleasantly smooth. Just don’t expect the device to set any benchmarks on fire. At a quick glance, the Sharp Aquos Crystal looks like a lock to redefine what a budget smartphone should look and feel like. I am already thinking what a high-end device with similar design and layout will be like.